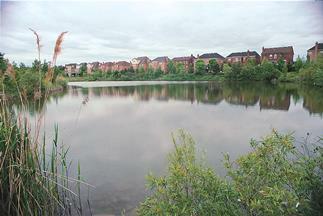 Stormwater ponds have been used extensively in North America to manage runoff from urban areas. Like other end-of-pipe practices, they should be used only as a last resort, after all other upstream opportunities for source controls and infiltration have been fully employed. Stormwater ponds can differ significantly in the level of control provided. Ponds constructed before the late 1980s, for instance, were designed primarily to reduce peak flows, and are therefore much smaller, and often lack a permanent pool of water. Later ponds, designed to provide both water quantity and quality control, are typically larger and support a permanent pool with active storage. The added storage allows more time for sediment and associated contaminants to settle out as water is gradually released to nearby streams. Ponds are not as effective as infiltration practices in restoring pre-development hydrologic conditions because they only reduce the rate, not the volume of stormwater runoff entering watercourses. Several aspects of the pond design control how well it improves water quality and reduces peak flows. These include permanent pool storage volume, active storage volume, length-to-width ratio, presence of a forebay or cells, and the location of the inlet and outlet. Guidelines on the design and implementation of stormwater ponds in Ontario are provided by the Ministry of Environment in its Stormwater Management Practices Planning and Design Manual.